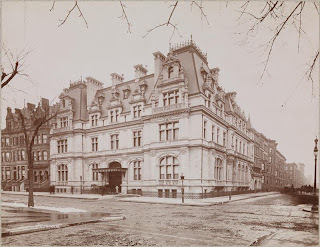 The John Jacob Astor IV and his mother Caroline Schermerhorn Astor residence designed by Richard Morris Hunt c. 1896 at 840 Fifth Avenue and East 65th Street in New York City. The Astors moved into this house after demolishing their brownstone at 34th Street and Fifth Avenue to build the Astoria portion of the Waldorf-Astoria Hotel. Click HERE for more on the Astor residence which was demolished in 1926 and replaced with Temple Emanu-El. 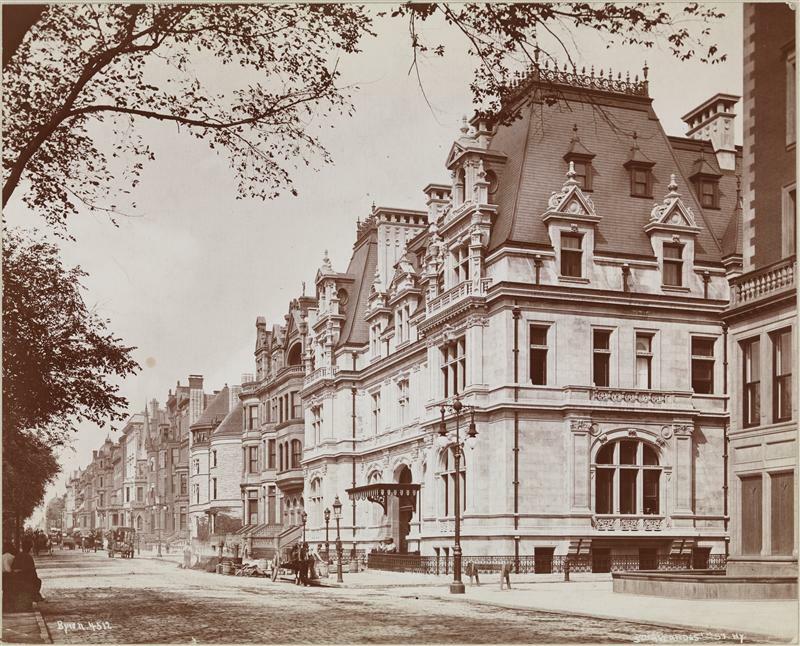 The above photo was taken in 1897 and below in 1898 (which is one of the best images of Fifth Avenue before the turn of the century I've seen). Photos from the Museum of the City of New York. I had no idea floor plans existed somewhere. I've looked through all the Hunt's books. Thank you for the link. I never really liked this one. "Richard Morris Hunt's creation was put on display February 1, 1896. A thousand of the elite came to wonder at the marvel achieved by the wedding of the architect's genius and the Astor fortune in the immaculate gold and white ballroom and the gorgeous ebony and gold dining room. Two days later Mrs. Astor gave her annual ball, the first since 1890. 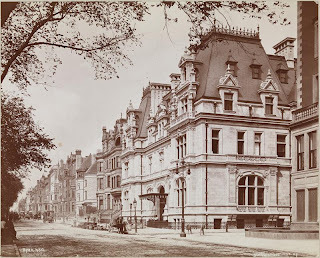 The most beautiful cotillions in twenty years, sighed old New Yorkers, while the youngsters looked in hushed awe at Hunt's use of color and form to provide Mrs. Astor with the regal setting she needed. Even Mrs. Astor seemed to have been sobered by the magnificence of it all, for she deserted the purple velvets of yesteryear to appear in a gown of palest grey satin trimmed with embroidery and lace." The interior was much improved when renovated as a single home for the son highlighted by a skylit courtyard. Manhattan had class and character back then. I wish I could transport myself back in time one hundred years and take a stroll through the City.